People will occasionally ask me how often they should meet with their financial advisor. It varies from person to person, but I recently read an article that suggested you sit down with your advisor every quarter. Every quarter? That was certainly news to me. If you have a competent and trustworthy advisor, someone you feel comfortable with, unless there’s a major change in your life (see below), meeting every 3 months is probably excessive. That said, the opposite is true, as well. With few exceptions, if you haven’t spoken with or had any communication with your advisor for more than a year, you might want to consider finding a new one. It’s 10:00 PM. Do you know who your advisor is? Because there’s so much at stake, the advisor-client relationship is a special one. If meeting with your advisor every three months is something that makes you feel more confident, then perhaps that’s something you should consider. But I’ve found that the very reason that most people hire a financial advisor is so that they can have an expert to deal with the stress of the day-to-day oversight of monitoring the market and investment allocation. Simply, people hire me to do the watching and the worrying for them. Let’s say you have a good relationship with your advisor, and you meet with her once a year, and that seems to be working out fine. The following are circumstances where you should absolutely meet with (or call) your advisor sooner than your regularly scheduled meeting. You’re suddenly forced to retire. 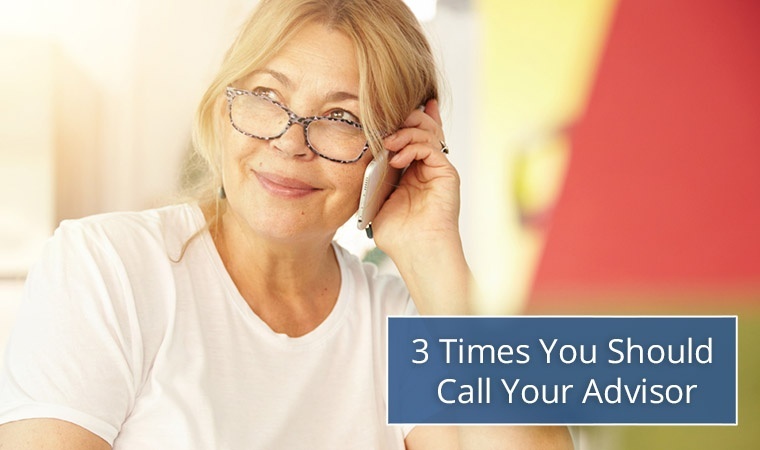 If you’re faced with a life-altering health issue, an offer of an early retirement buyout, or you get laid off, the first call you should probably make is to your advisor. In circumstances such as these, there’s likely going to be money in transition. Do NOT rely solely on your employer’s HR department to tell you what to do (what’s best or easiest for them may not be in your best interests). Plus, HR departments make mistakes. I once met with a person who had unnecessarily paid $20,000 in taxes due to the advice of a well-meaning company employee. For more information on how to navigate a sudden retirement, read our free Emergency Retirement Guide, today. You and your partner can’t agree on anything financial. Money is often at the root of arguments between otherwise compatible couples. This is especially common when it comes to estate planning, but it also occurs with investments. We all want control, because control makes us feel safe. Think of your advisor as a couple’s therapist for your money. A good advisor is going to remain unemotional, mediate disputes, and help you and your partner locate common ground. Marriage, divorce, adoption, buying a house, etc. Any major change in your life that involves your money should immediately prompt you to call your advisor. This particular topic could fill a hundred books, but for the sake of example, let’s take a new marriage. Do you want your new spouse, or do you want your children from a previous marriage to inherit your retirement accounts? Here’s something a lot of people don’t realize: Do you know that the benefactor on your retirement account(s) [such as a 401(k)] supersedes whoever is listed on your will? That’s right. Someone you may have listed as the beneficiary on your 403(b) 30 years ago takes precedence over whatever it says (for that account) in your will. Then there’s debt and credit. In some scenarios, when you comingle certain assets, you may also be comingling debt. Simply, his debt from before your life together could potentially become your debt from that day forward. These are just a few of the literally thousands of scenarios where your advisor can provide guidance and clarity, and perhaps save you money, heartache and stress. Remember, contact your advisor before you embark on any major life change that involves your money, or which could alter your future retirement plans.